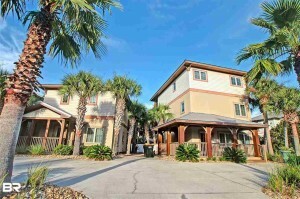 Gulf Shores beach house for sale at Kiva Dunes. This amazing property features two residences with a combined total of 6 bedrooms and 5 full baths, it is the perfect family home or real estate investment with room for the entire family to vacation. Enjoy all the Kiva Dunes amenities including community pools, shuttles to the beach walkways, Kiva Grill, and the new Kiva Beach Club! Both homes feature granite counter-tops, stainless steel kitchen appliances with tile $ carpet flooring throughout. Outside is a shared pool and entertainment area. Beautifully landscaped grounds. HVAC in both houses replaced in both houses in 2016. Come see this one today!